From the always excellent Nag on the Lake, we learn about a rather rare weather phenomenon—not often encountered due to the exacting conditions necessary and first described during Roald Amundsen during his 1911 expedition to the South Pole but now that everyone carries a camera at all times, we are treated to ample evidence—called snow rollers. A modest gust of wind propels a kernel of snow near the melting pointing across a wet, loose surface and collects layers, tubular formations that leave tread rather than a typical snowball. 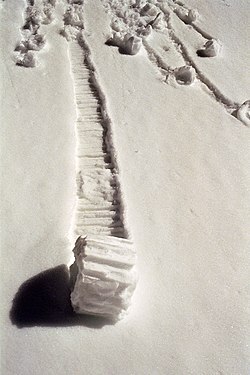 Be sure to visit the link above to learn more and see video footage of snow rollers in action.